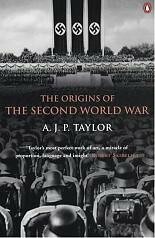 "The Origins of the Second World War"
A book I read to hopefully obtain a better understanding as to why World War Two came about and therefore the resultant impact it had on so many German people. I learnt a lot more about the grievances of the German people regarding the Treaty of Versailles and especially the situation that the Sudetan Germans found themselves in. Though I remember seeing A.J.P. Taylor on television when I was a child, I am only now appreciating his work as an historian. An extremely well researched book by an historian who does not just repeat the "convenient conclusions" documented by many other writers as to the events leading up to World War Two but, regardless of any accusations made against him, produced a book that is so "easy to read" whilst including so much detail. A quality examination of the period that is recommended if only to provide a "background" to what would happen in the following decade.